It had been 15 years since I had been to Ireland when I boarded a plane last week at Logan. And part of me was so dang excited and part of me was so dang sad. When I say that I planned this trip for two people, I'm guessing you can figure out which two. So, when it became clear that I was either going by myself, or going with someone else, I didn't even begin to entertain the idea of just not going at all. Why? I mean, for one, it was bought and paid for. 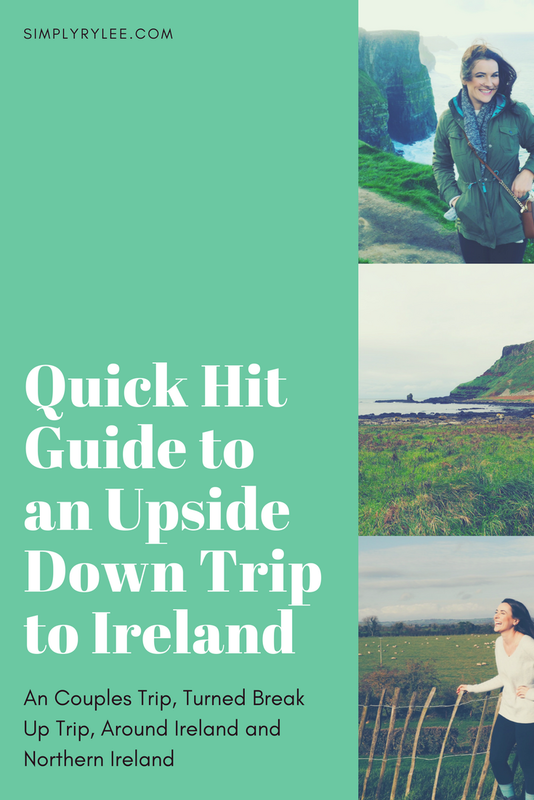 But two, honestly, I came up with the idea of us going to Ireland. I planned our route through the country. I booked the AirBnBs. I planned all of it, and I didn't want to not go, just because I wasn't going to be going with him. Now, that's not to say it didn't sting. I was pretty clear with the people in my life in the days before the trip that I was excited, but not as excited as I had been. There was a whole trip that I had to mourn before I could get excited about the trip I was really going to take. And sister, that is hard. But, I went. I got on the plane. I drove the car. I picked out restaurants. And I did the full blown tourist thing, left and right. And with that, I'll give you, the Ireland Itinerary. Just outside of City Centre, about a 25 minute walk away in The Liberties neighborhood. It was perfectly tucked away from the high traffic of the city, but was very much inside the city as well. It was small, but in the best European-small way it could be. Here's the AirBnB: Little Dublin Studio. The Riddler: With walls, pillows, and tables covered in actual riddles, and a menu that boasted "modern Irish dishes," we were hooked. Also, we found it when we desperately needed coffee and had been up for roughly 27 hours. Bestseller: It was one part bookstore, one part coffee shop, and one part bar. So naturally I got another latte, and a very Irish morning treat: a sausage roll. And what does Julia get? Hot. Wine. Warmed chardonnay with mulled apples and cloves. It was insane, and delicious. The Temple Bar: Of course, Guinness and goat cheese crostinis were ordered. If you ever get to The Temple Bar take time to walk around - it's a big space, and often crowded - while we quickly got a great spot, it's worth getting a feel for the place. Plus! Legend has it there is a UVM Rescue patch in the collection of the bar's famed wall. We visited the Dublin Castle, Trinity and Graton Streets. We stopped for macarons. We ogled at all the flower vendors. We went to a for real Disney store. While we were at it we spotted a Duck Boat. You know the ones in Boston, they're the boats/trucks that do city-wide tours, and then hop in the water too? Well, they've got them in Dublin. Only, they are called Viking Tours. I was sold. So that night, while we ate quesadillas in bed, we booked ourselves a tour. The Viking Tour was exactly like you'd expect. There were funny hats, and we grunted at people on the streets, and we even had a cheeky driver who made corny jokes. This was the beginning of our long trek around the country. Which, after we made it through many many kilometers of farmland, was actually going to take us into Northern Ireland, United Kingdom. But on the way there, we decided to stop at Newgrange. A 5200 year old tomb in the middle of Boyne Valley. It was a stunningly beautiful day, there were tons of sheep, and we felt v cultured. When we finally made it to the AirBnB (in the middle of a hospital plaza) we were starving. Thankfully, we had the bests hosts and this one left all sorts of restaurant guides and tourist info. Thyme Deli: The "best" sandwich joint in Belfast. Oh, you guys, talk about chips. These were garlic buttered fries, next to my amazing turkey bacon sandwich that was served with banging pasta salad and sweet-chili Doritos. I was in heaven. That night, we got late-night Burger King delivered to the AirBnB, and I tell you what, I felt zero shame. Again, this is a totally walkable city. We hiked our buns over to the port side of the city and visited The Titanic Experience. As my dad has mentioned three times since I've been home, my great-grandfather was a steel worker on the Titanic - so this was extra exciting, if you ask me. The museum was great - really interactive (there is a ride inside the museum,) really informative, and about so much more than just a ship that went down. Finally, before starting the trek up and over the northern most points of Ireland, and landing in castle county, we made it to Giant's Causeway. I could likely write a whole post on the nostalgia, the views, the awesome-included audio guide, and how wonderful it was to hike up literal cliffs - but, the point is, if you can go, you must. This AirBnB is one we really wish we could've stayed in longer. We arrived late after our day at the Giant's Causeway, but tucked in nicely to all the amenities. It included cookies, a Nespresso, and loads of DVDs. Mary Murrins Pub: Though just one town over from the AirBnB, it was a world away. We sat next to the perfect little fire, got a few looks from the locals when we walked in, made friends with the waitress, and got them to play Sweet Caroline. Olde Castle Bar: Situated neatly across the street from Donegal Castle with a very traditional Irish menu, and nice cold hard ciders. It was the perfect long lunch on a rainy afternoon. At this point, we were plumb tuckered out. So we slept in, took it easy, toured the Donegal Castle and strolled through the town on our full day here. We also got some shopping in, watched some movies, and just took a bit of time for actual leisure. We left the Dunkineely area pretty early to head way down to Corofin in Galway county, and phew, that drive was good. Coming down through the north into the heavily fished southwest, was stunning. This was the only AirBnB that operated more like a B&B, and honestly, not that bad. (Coming from someone who isn't big on forced socialization with strangers.) The real sweet spot was the location, it was very much in Galway, and still not in the heart of the city. The Dough Bros: We started the morning off right with a pizza-brunch, on day two in Galway. This was good pizza, I mean, damn good. And yep, we had more cider with it. The Bunch of Grapes: Stopped in for a couple pints and what honestly was one of the best mocha lattes of the trip. Perfect little pub with a fire, an old paper, and a quiet bartender. O'Reilly's Bar & Kitchen: As we headed out of the city for the night we stopped at the Salthill Promenade and grabbed a light, and very quiet, dinner here. Well, we started our time in Galway County with an 8k road race in Corofin. A very unique...bizarre?...experience for someone who has a good history with road races. It was great! A good course, nice people, well managed - but everyone but us was part of a running or athletic club. There were no Joe Schmo's off the street that came to run. We also spent one quick morning in Salthill walking along the beach before heading into Galway for plenty of food, shopping, and walking. Finally, before heading back to Dublin, we made it to the Cliffs of Moher. One of the top things on my list when I booked this trip, and boy, it did not disappoint. The wind was unreal, and at one point there was hail. But it truly was unlike anything else. Before flying out I knew I wanted something simple and relaxing, and well, this cabin-like AirBnB, was also fitting for my OG travel partner. It was a good 15 minutes outside of Dublin city, and was a true tiny house-esque cabin. Absolutely delightful before a 25 hour day of travel. On the road. McDonalds, if you want to know the truth. And you know what? It was the chicest McDonalds ever, and it was delish. We unpacked, repacked, and slept. The long and short of it is this: plan an adventure, it's worth it, always. It might surprise you that the weather, the people, the food, and the views are all absolutely perfect. And yes, Ireland is a great place to start.